Executive Customer Experience (ECX) online courses are designed for the busy manager or employee involved with the customer experience. These courses are designed to be completed in as little as 60 to 90 minutes per course. The purchase of all 6 Executive CX online courses gives you 3 months of access, so you will be able to review or spend more time learning if desired. 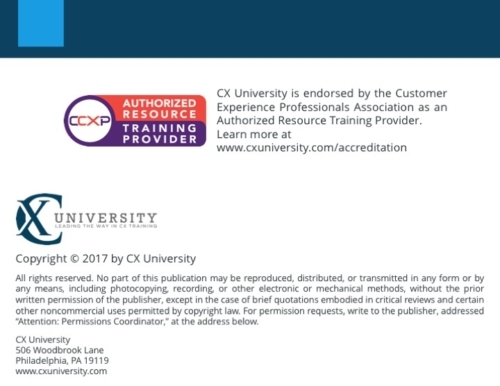 Each Executive CX online course is filled with high impact information that teaches CX concepts, terms, principles, and methods. Narratives are supplemented with videos, brief and readable articles, and interactive application playbooks which allow you to practice key CX skills. This course is designed to help you understand what it means to be able to position your company in a competitive market through a customer experience strategy. It will help you develop a deeper understanding of a changing business landscape that challenges you to question every aspect of your current business stance. It draws upon relevant research and practice to help you apply concepts that are applicable to your business. 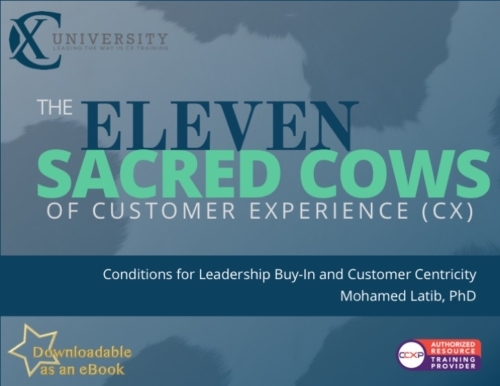 This course will introduce you to the significance of establishing a customer-focused organization, and how this can be achieved by applying principles drawn from research and practice. A key aspect of building a customer-centric culture is to intimately involve the customer population, as well as all internal stakeholders. The course, therefore, will also focus on how to build customer and employee engagement. The course will explore various models of engagement, their impact on creating value, methods to galvanize all stakeholders through unified internal communications, alignment with customer experience strategy and building brand value. In this course, you will be introduced to the concept of organizational adoption and accountability: what it is, why it’s critical, and how winning the “hearts and minds” of all employees to advance the customer experience is necessary for success. Key aspects of becoming a customer centric organization includes understanding the customer experience ecosystem and organizational change. The course will focus on these themes and how organizations need to align to adopt a customer experience mindset. The course will also explore how this adoption can be measured to ensure accountability. ECX404 METRICS, MEASUREMENTS, AND ROI. In this course, you will be introduced to the metrics and measurements that are used in customer experience management. Building a customer experience centered organization requires incremental change, and measuring this change is critical to success. The course will focus on these themes and how organizations choose, improve, and understand their metrics. The course will explore various customer experience measurements as well. It will explain how these measurements are used and which metric can be used to measure different aspects of the customer experience. The course will also discuss methods for measuring the Return on Investment (ROI) of CX. This course will introduce you to the concept of design thinking and its application in CX practice. It will also cover customer journey mapping, a powerful diagnostic tool used to understand and improve customer experience. You will explore the key objectives of developing journey maps and the development process. The course also discusses a handful of practical tips that help you make your journey mapping exercise an actionable tool to achieve your customer experience goals. Emotional and motivational advances are also discussed to provide suggestions to engage stakeholders in the CX ecosystem. This course will introduce you to the concept of Voice of the Customer (VOC) and its role in the development of a customer focused organization. It forms the foundation for harnessing insights and making changes to leverage the strengths of companies and mitigates all the weaknesses. You will understand the scope of VOC activities, how it is necessary to integrate it into the fabric of businesses, and its growing importance for overall business performance. Each Online Course is entirely self-contained and built for independent study, allowing you to learn and review material at your own pace and schedule. For the bundle of courses, you can select which course(s) to begin and when with a total of 3 months of access.